The other day, on our way home, hubby felt a bit dizzy. We blamed it on his hypertension. Excessive climate change can trigger reactions like this and lately, the Philippines has been on the verge of a heat wave. We decided to stop by Mini Stop, a convenience store, to buy juice. We couldn't find a parking spot so we just stop by the side of the road and turn our hazard lights on. To avoid being reprimanded by traffic enforcers, hubby tried to walk really fast towards the store. Bad decision. The dizziness caught up with him and he lost his balance. He tried to regain his composure and placed all his weight on one foot, to no avail since this too buckled. The result: a sprained ankle. When he finally got in the store, he also bought some ice so he can press them close to his ankles as a sort of cold compress. He kept a brave front, but I knew he was hurt. The next day, he just couldn't get up. His ankle hurt too much. The said ankle had ballooned, too swollen to hit in his shoe. I talked him into going to the hospital. Initially he just wanted to go to the nearest one, but I argued that we should go to one that has complete facilities. I immediately thought of Marikina Valley Medical Center. We arrived at the emergency room at 7:00 am. There were no other patients. The room was dark, and the nurses, probably already sleepy from their night shift, were slow to approach us, despite seeing hubby miserably limping in. We were greeted by an eager, friendly, smiling nurse. He made me sign the papers, and then he took hubby’s blood pressure. 140/90. hmmm… I seriously doubted the accuracy of this reading since hubby’s pressure is usually 150/100 on a good day. After waiting for some time, the nurse prepared a cold compress. The doctor finally approached us with the prescription bearing medicine we should buy:Arcoxia 120mg for the pain (P70+) and Myonal which was muscle relaxant (P20+). I asked shouldn’t hubby’s ankle be wrapped in elastic bandage as a sort of support? The doctor thought for a while before finally saying ok. She instructed the male nurse to put a bandage on hubby’s ankle. We were waiting and waiting and waiting, until I finally asked what was taking them so long. The nurse said that they were still waiting for the approval from our HMO…again, for some bandages! Argh! Why didn’t they request for that in the first place? Wasn’t that part of their S.O.P treating sprained ankles? I went to talk to the cashier and told her that we’re willing to pay for the bandages ourselves if this is the only cause of delay, when finally the approval came through and the eager, smiling nurse came bouncing back in the emergency room with the controversial bandages. He bandaged the ankle a bit too tightly, but hubby pretended not to mind since this will surely take some more time to undo and redo again. We finally left at past 9am. 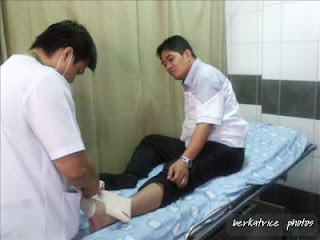 It took more than two hours to be treated at the “emergency” room for a mere sprained ankle! And the hospital wasn’t even bustling with other patients at all! 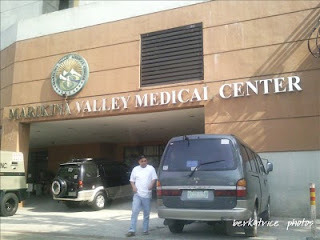 So after that experience, what can I say about the Marikina Valley Medical Center ? Let me start with the positive. They are accredited by several HMOs, Intellicare included. The personnel, doctor and nurses were courteous and polite. The facilities were new and readily available, like the x-ray and the results were available immediately. They had available medical supplies like rubber gloves and elastic bandages. I have been receiving lots of comments with this blog post, some positive, echoing my not-so-great experience in this hospital and some negative. I'm assuming they are somehow connected to the hospital (staff or admin) since they kept on defending the hospital. Please understand that this is an old post, but this is what hubby and I experienced then so this blog post is about that experience. I didn't write this to bad mouth anybody or any institution. I am just sharing my experience with the hospital. By the way, I was back again last year but this time as an outpatient with a dermatologist. I know, I know. Why come back when I was unhappy with their services before? Well the hospital is near our place, and it had great facilities. I'm not one to hold a grudge and I wanted to try the hospital again, believing it has improved since our last visit. Sadly, I had a horrible experience with the dermatologist and but will not go into details since I believe the bad work ethics of one doctor does not necessarily reflect the whole hospital's quality of service. It was very frustrating though. I'm so sorry about your experience. Hope your Hubby is feeling better. US emergency rooms aren't much better- one time I was really dizzy and ended up spending 8 HOURS in the emergency room, while they did a cat scan, gave me an IV, and then just sent me home telling me to rest. We just had a bad experience with the same hospital. 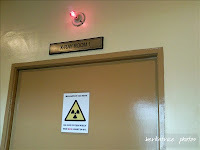 The admitting personnel kept us waiting for almost 7 hours before we can have our private room (that was 1030 am to 430 PM). Come 5PM,they will tell us that there is no available room and we just have to transfer. She even discriminated the HMO of my sister. Saying,"1k lang pala coverage eh, pang ward lang kayo." To receive that comment with your sister who's needing medical attention. why would she bother to say that. it was really frustrating experience. Btw, I want to broadcast the name of the personnel, Carmencita "Mench" De Leon (admitions department). hi mr berto and ms kwala. just happened to chance your article on MVMC. i am really very sorry for your experience, there were also some good comments in your post on MVMC, and i thank you for that. it was an old post, i am confident that this time around, things will be better. really stupid secretary and personnel inside this hospital. their crew are such a lame and would probably get you your family into a bad mood and temper before you even get what you need. Please become a good service oriented institution rather than a facility whereby all employees just awaits for their time-off and pay-day. I know the article's old but the idea is still much the same until now. Let this serve as an explanation for those who will chance upon this article. Remember that a hospital is a business. Highly difficult to manage especially with regards to communication with HMOs. If you have problems with waiting, why get one? With HMOs, it's supposed to be like that. Simple as that. You said they kept you waiting just for a bandage. Let's look at the hospital staff's perspective: you work as a nurse there and you don't want your irritable patients to be waiting. You just want to make their life easier. So what's the logical thing to say? "Sir kelangan pa po ipa-approve yung gamot/bandage/etc. Kung gusto nyo po makuha agad, pwede naman po na bilhin na lang muna." Based on my experience, this is the answer we usually get: "Ano?? May card na nga ako tas pabibilhin mo pa ko?" (Sometimes it comes with added verbal offense). Miserable life for the good nurse. You just made his day. The next logical step for the nurse is to just let the future patients wait no matter how pissed they are in waiting. The blood pressure is a white lie. Patients especially old men care about their blood pressure so much that when you say their bp is 150/100 or 180/120, they worry much more leading to another increase in blood pressure. About the cashier, it's not their fault. They just follow the hospital policy from the higher-ups. Even if you complain to the medical director or any high ranking hospital officials, they wont listen to you. Besides, they're the ones who usually hide and doesn't want to lend an ear to complaints. They just want to sit comfortably in their offices. The cashiers are the punching bags. No wonder why MOST (not ALL) of the cashiers from hospitals lack respect (They're like the employees from NAIA, got so fed up with disrespectful passengers that they become disrespectful too). About the xray being carried out before the approval, it wasn't done out of stupidity. You said your HMO is Intellicare. That company easily approves procedures as long as it is reasonable unlike the HMO Caritas. Experienced cashiers have the guts to initiate procedures even if it's still pending approval. You should thank her, it shortened your waiting time. The last and most important, if you know what to do with injuries or disease why go to the hospital? It seems that you're the ones telling the doctors what to do. Have a nice day. You said they kept you waiting just for a bandage. Let's look at the hospital staff's perspective: you work as a nurse there and you don't want your irritable patients to be waiting. - I was willing to wait... in fact we waited. What I didn't like was that we had to go through the whole HMO process TWICE just for bandages which should have been part of the treatment in the first place. The blood pressure is a white lie. - Medical practitioners are liars? tsk tsk...my husband is not an old man, but he's a big boy, he can take the truth about his blood pressure, in fact in a hospital, he expects nothing but the truth. About the cashier, it's not their fault. They just follow the hospital policy from the higher-ups. Even if you complain to the medical director or any high ranking hospital officials, they wont listen to you. Besides, they're the ones who usually hide and doesn't want to lend an ear to complaints. They just want to sit comfortably in their offices. The cashiers are the punching bags. No wonder why MOST (not ALL) of the cashiers from hospitals lack respect (They're like the employees from NAIA, got so fed up with disrespectful passengers that they become disrespectful too). - I have no complaints about the cashier... please read my post again. About the xray being carried out before the approval, it wasn't done out of stupidity. You said your HMO is Intellicare. That company easily approves procedures as long as it is reasonable unlike the HMO Caritas. Experienced cashiers have the guts to initiate procedures even if it's still pending approval. You should thank her, it shortened your waiting time. - Read post again, no mention of stupidity anywhere... Intellicare has different health packages for different companies. Hubby and I work in different companies, both under Intellicare but with different benefits and health coverages. Injuries that are covered under my company's health package may not be covered under his company's coverage, even if we're both under the same HMO. So it would be more practical and conservative for the staff to first seek approval before doing the medical procedure. I know this first hand because this happened to us in the same hospital on a different incident. They performed a head xray before getting the Intellicare approval, in the end we were informed that that specific injury was not covered by our HMO. We had to use our credit cards because we had no cash with us. What if we had no credit cards? Hugas-pinggan? The last and most important, if you know what to do with injuries or disease why go to the hospital? It seems that you're the ones telling the doctors what to do. - I would if I were a doctor or a nurse even. Hubby was an athlete in the national level though and he received training in caring for sprains and fractures since they are common in his sport. So he knows. But why care for yourself when you are working in a good company with health insurance? Everyone's just following the protocols. The office opens at 8. You may be the only one patient in emergency room, but the HMO may prioritize the other patients on the wards that needed their attention first. I have read some comments with the idea: "They kept us waiting for a room." The staff still prepares for a room to be used. It needed disinfection and other stuffs to make it more presentable. As for other protocol, the patient is assessed by the admitting on where to place them, on an isolation, reverse isolation or just a general ward. There are instances that there are no vacant room and the patient to be discharged have not yet settle their accounts so they have to stay there. The "waiting to be admitted" thing does not only happen to MVMC but to other institutions as well. As for the article per se, the medical staff are not liars. If your husband's usual blood pressure is 150/90 that doesn't mean it won't deviate from it. If you religously take your blood pressure, like every four hours in 24 hours and it still like that, there is a big problem with your husband. 140/90 is still high and the difference is not something to be flustered about. And anyways, who can control the mosquitoes from coming in and out of the hospital? Remember, the medical staff that serves you are Humans, not God, and the hospital they work in is a business establishment, not paradise. If you complain at every single thing they do, I guess you should go somewhere else. Hi! Although not visiting this hospital anymore is entirely your choice, please know that this is not my intention. I was just sharing my personal experience. I don't like this hospital at all, but to be fair, a very good friend of mine often goes to this hospital for their family's medical needs. Maybe you can also try them out, and judge for yourself. =) Good luck! 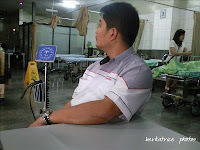 marikina valley medical center is a NIGHTMARE hospital. Very disappointing, poor service, kailangan mo pa follow up, pero ganun din. Parang wala nangyayari. I got a very good experience in MVMC, the people are accomodating, nurses at er are very nice and friendly.